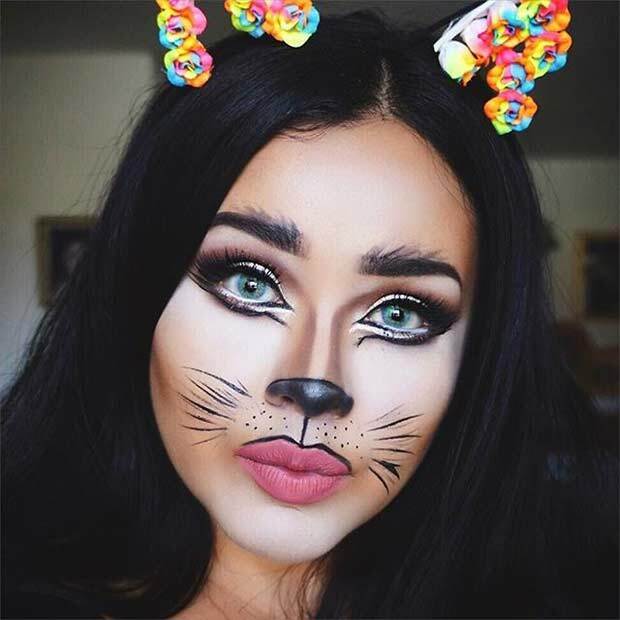 With everyone reaching for the super scary and blood-and-guts style makeup for Halloween this year, why not take it back to cute with these pretty and easy Halloween makeup looks? 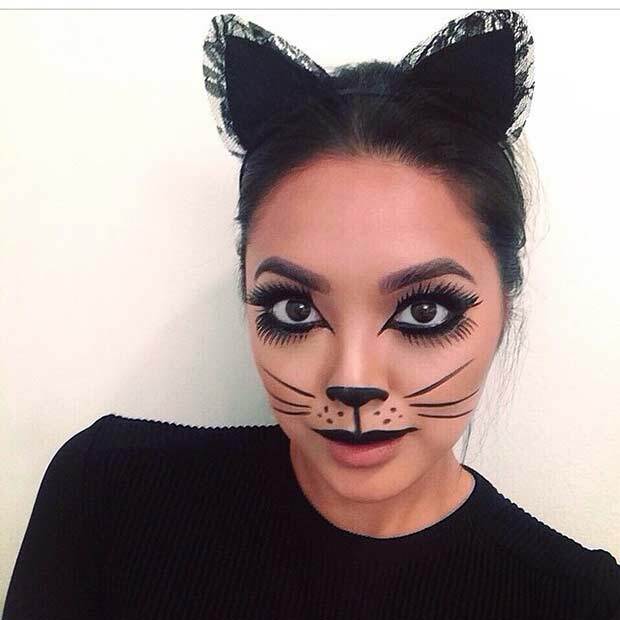 For when you’ve only got five minutes to get ready because, like many of us, you left it too late and couldn’t get your hands on a costume, or for just when you want something simple because you seriously overdid it last year, these are great for using things you’ll already have in your makeup bag. You might not understand the connection between Halloween and black cats, but it’s because witches are spooky, and witches often have black cats. Now do you see the connection? In the middle ages, cats were first associated with their witchy friends, and many of them were culled … around the same time as the Black Plague. Sadly, the culling of these kitties proved detrimental to mankind – rats spread the black plague, and the cats would have caught the rats. Ooops. 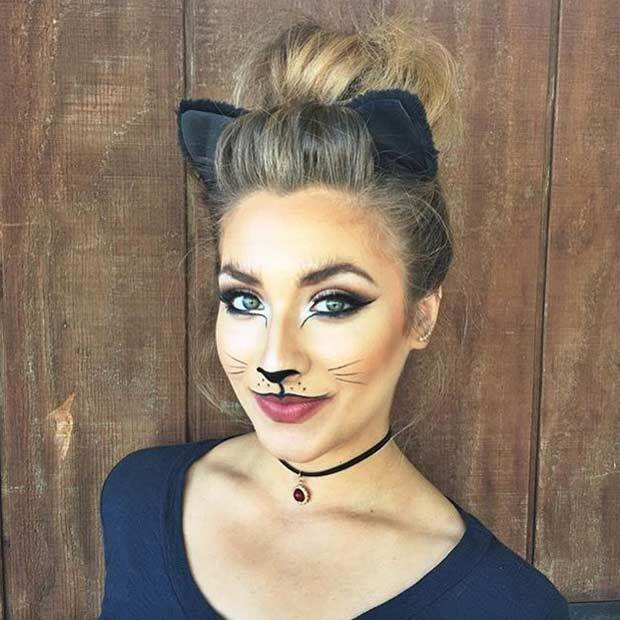 See, we know we need to pay homage to cats, that’s why we’re loving these easy Halloween makeup looks. 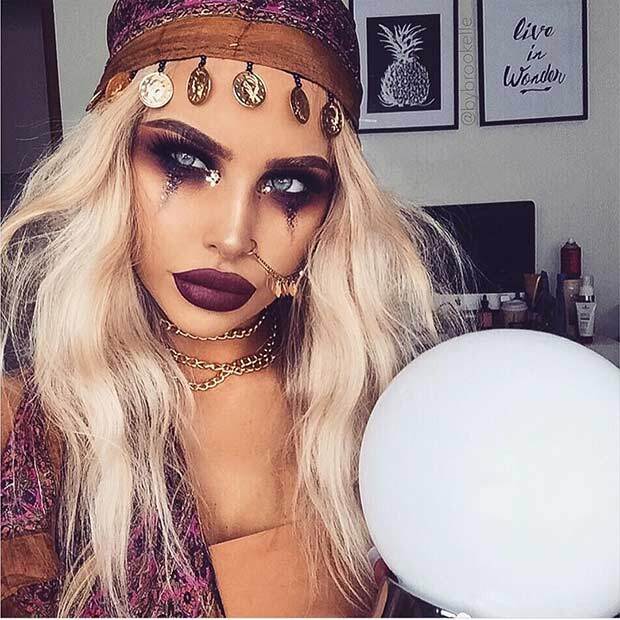 The fortune teller isn’t exactly a common costume you’d associate with Halloween, but in a world where literally all the other costumes are taken, you need to start thinking outside the box. 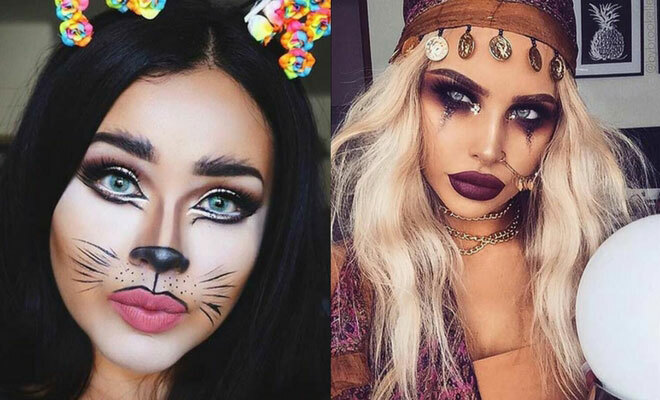 If you wanted to tie this in with Halloween a little more, and you just happen to have a fortune teller / belly-dancing outfit in your fancy dress box, make it zombie-style easy Halloween makeup looks. Add some graphic and zombie makeup – black and white mostly – and you might just have a costume that could win all the competitions. Halloween is the time for magic, black, white and every single other kind. And when we’re talking magic, one thing is absolutely necessary – you need yourself a fluffy white rabbit. To ensure no rabbits are harmed in the making of your Halloween festivities, we’d suggest dressing up as one instead. Plus, who doesn’t love a cute white, fluffy bunny? Hunting is a big topic these days, and we’ve seen a few hunting-themed fancy dress outfits that we’d love to rock for Halloween. You can guarantee there’ll be a hunter at the party somewhere … and even if there’s not, you can just call it a good night. 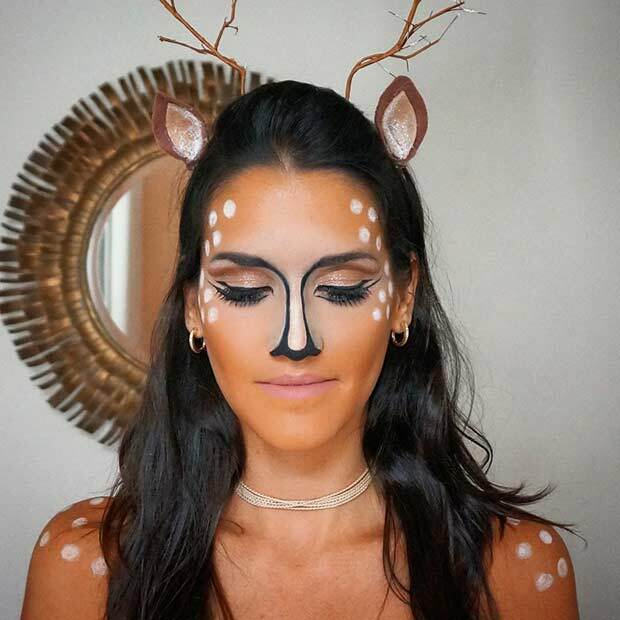 Plus, this deer-themed makeup is everything right now, and we are looking for any excuse to rock it. Who doesn’t want to be a mermaid? We all want to be mermaids. 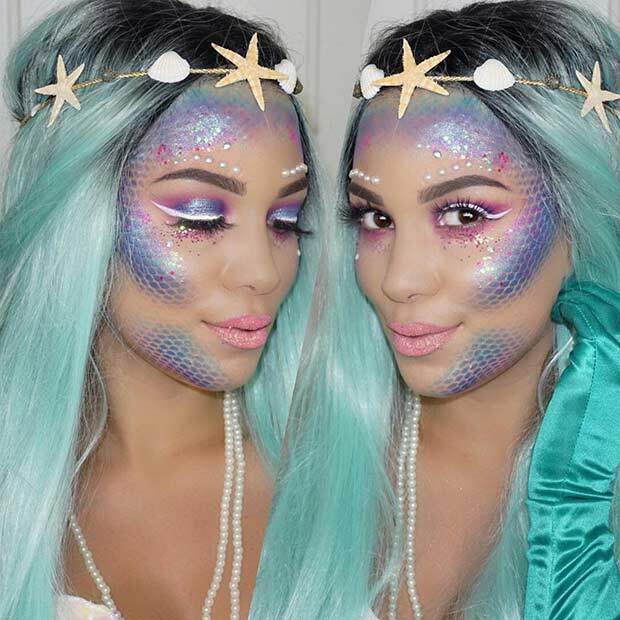 With makeup like this, you too can be a mermaid for Halloween this year. If you want an easy way to recreate this look, here’s a great tip – a pair of fishnet tights or stockings can be held over the face, and then makeup applied over the top. When you remove the stockings or tights, they will have created a stencil effect, much like you can see here. What a great idea, right? We recommend that you get practicing right away. With makeup like this, we would imagine half the potential new suitors in the party will be interested. Wouldn’t you be? 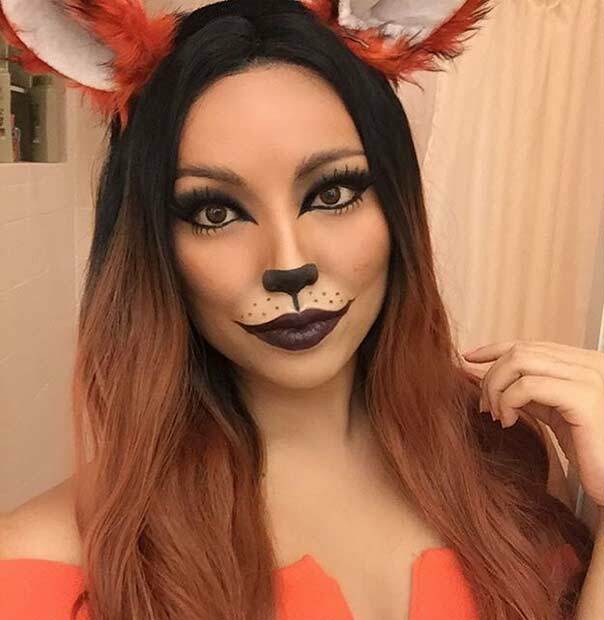 And if getting catty isn’t your thing, how about getting foxy instead? This would make the cutest costume for a good trick or treating session, big kid and little kids alike. If you live in Illinois, Belleville to be precise, you’d best not make plans to go trick or treating. It’s actually illegal to go trick or treating there if you’re over the age of 12. We suppose it is really a time for kids to dress up anyway … If you’re a teenager and you’re caught T&T’ing at Halloween, you could be fined from $100 to $1,000. More than what you’ll have in your loot bag, that’s certain! Here’s a fun fact about Halloween we bet you didn’t know – Harry Houdini actually died on this day in 1926. It wasn’t from one of his infamous, daredevil tricks however. It was just a raptured appendix. Not really going out with as much of a bang as you’d have thought … right? 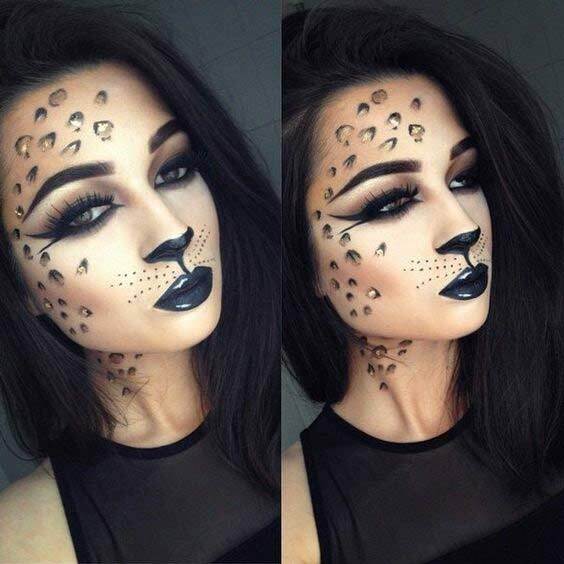 You can go IN with a bang with this cheetah-inspired makeup for Halloween though, and here’s a clever trick if you’re going to be using a lot of eyeliner. You can turn a pencil eyeliner into a gel eyeliner with the help of a lighter. Just hold the pencil edge over the flame for a few seconds, and when you use it, it’ll be more soft and gel-like than the hard pencil. A reindeer isn’t exactly what you’d consider to be a Halloween-themed look, but this one is a little clown-esque … if a reindeer could look clown-esque, of course! Plus it gives you plenty of practice for those Christmas makeup looks you’re trying to nail. It’s cute, pretty and easy so technically it ticks all the right boxes. Plus you can still rock your favorite killer eye makeup, which instantly makes it a winner in our eyes. Back in the Medieval times, predominantly in Spain and France, it was believed that black cats were the bringers of bad luck, and if any human were to come near them, they’d be cursed. In Germany around the same time, you were luckier because you’d only be cursed if the black cat in question walked in front of you from left to right. We think these poor black kitties are getting too much of a bad rap, so we’ve brought you a super cute kitty to help spin things around. Someone’s gotta stand up for the little guys!